Are you searching for new flooring that breathes life into your home? Then, consider the advantages of luxury vinyl flooring in College Station, TX, from Brazos Valley Floor & Design. This flooring type is so realistically beautiful the manufacturers had to add the word “luxury” to the name. We invite you into our flooring showroom to explore our extensive selection of luxury vinyl in tile or plank. Tile is a flooring selection that everyone loves. However, you may adore tile, but prefer an option that costs less and requires little maintenance. 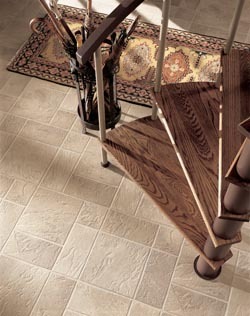 Our sales and design professionals have just the right flooring for you -- luxury vinyl tile. This is a floor covering that closely resembles ceramic, porcelain, or stone tile, such as slate, but is made of vinyl. With advanced embossing techniques, all the details you love about tile flooring are present in full glory. Luxury vinyl has beauty and performance to recommend it. It’s available in a wide range of styles, patterns, and colors, so you have endless decorating options. In addition, vinyl tile has the ability to stand up to heavy foot and paw traffic and still look lovely When the children and pets have finished playing, all you have to do is sweep away dust and dirt and follow that with damp mopping with a small application of cleaning solution. Just like that, your floors are clean and gleaming. Hardwood flooring is a classic that adds its character and elegance to your home. You can get the same handsome appearance with minimal maintenance required when you choose luxury vinyl plank flooring. This selection is made to look like hardwood down to the features that you love, including the grain and gloss. Vinyl plank has other merits, too. It resists water. It can be installed in any room of the house, and it is quiet and cushiony underfoot. Our showroom has luxury vinyl plank in a pleasing array of wood species, finishes, and textures. Vinyl is also available in a product we call resilient flooring. This flooring option comes in appealing selection with quality built in. It’s called resilient because it can take a beating from the wear and tear of daily life and still look great. Choose resilient floor coverings with a backing of felt or fiberglass in 6’ of 12’ sheets. With all of our luxury vinyl, we recommend professional installation. This ensures your floor surfaces are laid properly to avoid damage and ensure longevity. Contact us today with your questions about the different types of luxury vinyl flooring. We proudly serve customers from College Station, Bryan, Navasota, Hearne, and Caldwell, Texas, as well as the surrounding areas.